AS previously mentioned in these ramblings, our four-year-old daughter Bonnie is not absorbing the influence of her rowdy elder brothers and becoming a tomboy. Quite the opposite. Much to my surprise and bewilderment, she can be the girliest of all girly-girls. She’ll always choose a floaty dress rather than trousers, will chat away about ‘pretty things’ with her pals, the Disney Princesses, and will pronounce, over-dramatically, “I’m scared” about everything from dinosaurs to the dark, (when she clearly isn’t). However, she did me rather too proud at the weekend when I finally got a blessed hour or two to tackle some over-due gardening tasks. Turning the compost heap has been on my to-do list for about a year, and as I shoveled the upper layers into a wheelbarrow, she spotted dozens of creepy-crawlies running, wriggling and slithering for cover. I expected her to decide that she was scared of beasties but to my surprise she delved right in with her bare hands, gleefully collecting fat brandling worms and letting them wriggle about on her palms. My requests for her to carefully put the worms back because they needed to be away from the sunlight fell on deaf ears – they were ‘her’ worms. They would be her friends. I had images in my head of finding dead worms in her doll’s house or chest of drawers. I explained that to the worms, she was a giant – “I’m not a giant, giants are big” – and that she might be scaring them. 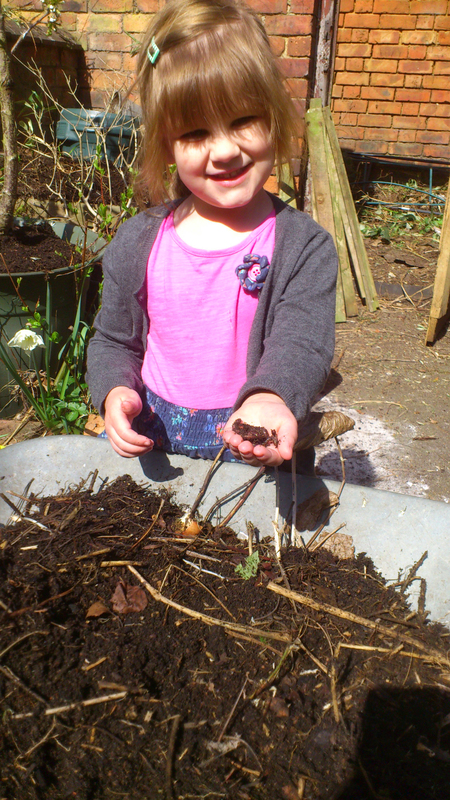 Only then did she reluctantly give them up to go back into the compost heap. That’s when she spotted the prehistoric-looking centipedes, running for their lives. She jumped, and hid behind me, unwilling to share my enthusiasm for the speedy bugs. “I’m scared of those,” she announced. I’m keeping quiet about my similar dislike of moths . . .